The head of the U.S. cannabis retailer that announced it intends to launch a $2.8-billion takeover bid for Aphria Inc. (APHA.TO), said he could raise his offer for the Canadian pot producer if the company's executives are willing to negotiate after spurning initial advances. Columbus, Ohio-based Green Growth Brands Ltd. said in a release Thursday it plans to offer $11 per share in an all-stock bid to acquire Leamington, Ont.-based Aphria. A successful deal would create one of the largest cannabis companies in the world, with an established retail presence in Nevada and 250,000 kilograms of marijuana production in Canada. "Negotiation is part of every combination," said Green Growth Brands Chief Executive Officer Peter Horvath in a phone interview with BNN Bloomberg Thursday night. "As we continue to lead the growth of our own business ... will investors value our company in a way that allows us to increase our offer? It's ​​just a matter of how the markets react to how our business performs and what our strategies are." Horvath said he approached Aphria last week with a friendly offer at $11 per share after visiting the company's growing facilities, but said the company's board rebuffed his initial approach and ignited the first salvo in a hostile takeover attempt. 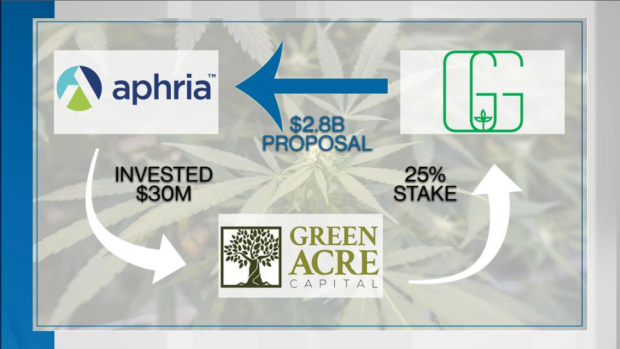 Under the terms of the offer, Aphria shareholders would receive 1.5714 shares of Canadian Securities Exchange-listed Green Growth Brands for each share held. Green Growth is deriving the $11 per share bid valuation from a concurrent financing announced Thursday, in which it says it will raise $300 million by selling shares for $7 apiece. On Friday, GGB’s stock closed up 2.61 per cent at $5.11. Green Growth said it intends to formally launch its offer in the coming weeks. “While we appreciate GGB's interest in the value we have created at Aphria and our significant growth prospects, their proposal falls short of rewarding our shareholders for participating in such a transaction,” said newly-appointed Aphria Chairman Irwin Simon, who stepped into the job Thursday after Vic Neufeld gave up the chairmanship while holding on to his CEO duties, in a release. “The Board has determined that the GGB proposal, as it currently stands, significantly undervalues the company,” Simon added. Horvath said Green Growth Brands acquired approximately 3 million shares of Aphria, or roughly 1.2 per cent of the company's total float, in the past week. He added that, all told, his company’s offer is being supported by investors holding roughly 10 per cent of Aphria’s shares. "I think [Aphria is] the real thing," Horvath said. "I think they're an undervalued asset. Between that and the sense on how they've been led, they're attractive to be combined with." Horvath turned to the cannabis industry after spending nearly four decades as a senior executive at fashion retailers American Eagle Outfitters Inc. and Designer Shoe Warehouse Inc., companies that are closely linked to the Schottenstein family, which is also Green Growth Brands’ largest shareholder. "I've done this before and one of the things you need to understand is what price did your shareholders buy in at," Horvath said. "Ultimately, they have a choice because they don't have to sell their shares, they simply have to convert them. And then they have shares in an entity that would be the most dominant player in global cannabis." If Aphria shareholders were to approve the deal, they would own about 60 per cent of the combined company, while Green Growth Brands’ shareholders would own about 34 per cent and financing subscribers would hold the rest, Horvath said, adding that would mean Aphria could control the majority of the combined company's board. "We view this $APHA offer as non-credible and likely an attempt to generate the appearance of demand in the hopes of spurring credible offers. A deal would allow for a change of control and a somewhat graceful exit for $APHA's tarnished management team." Green Growth Brands’ intent to launch a takeover bid comes after Aphria's shares plunged as much as 52 per cent earlier this month amid a short report released by Quintessential Capital Management and Hindenburg Research that raised concerns about a string of the company's acquisitions in Latin America. Aphria shares closed Thursday’s session down about 28 per cent from the time of the Dec. 3 report; but surged as much as 33 per cent in after-hours trading on the Nasdaq. Aphria has strongly denied the claims made by Quintessential and Hindenburg, pledging a “line-by-line” response to the report in the near future. Horvath said if there is any accuracy to the short-sellers’ allegations, those international assets could be written off but "the reality is that 99 per cent of what matters in that company is the supply agreements it has in Canada."